Music theory is one of those things a lot of musicians (I’m looking at you, guitarists) like to avoid. Most of the reasons I’ve heard are that it will reduce their creativity or box them in with too many rules. I see music theory as a tool that allows me to write and learn music a lot faster and make conscious decisions about what I’m playing. I’ll be coming at this from a guitarists standpoint but you should be able to transplant it to any musical venture. Chords might look incredibly complicated but when you get right down to the core of them, they only need 2 notes to function. There are 6 strings on a guitar which is why it can look like your fingers are spread all over the place when you’ve just been told to play a C minor chord. Knowing how chords are built will help you come up with interesting and perhaps better sounding guitar parts. Root, 2nd, 3rd, 4th, 5th, 6th, 7th. Open, 2nd fret, 4th fret, 5th fret, 7th fret, 9th fret and 11th fret. Chords are made using the root note, the 3rd and the 5th. If we look at a C major chords, those notes would be C, E and G. The C tells us what chord we’re playing, the E tells us it’s a major chord because it sounds happy, and the G makes the chord sound a bit fuller. We could quite easily get rid of the G and still be left with a happy sounding chord. Take the 9th fret on the G string (E) and play it with the 9th fret on the B string (G#). You’ve just made an E major chord with 2 notes. With guitar, less is quite often more, and these 2 notes could be a great way of playing an E chord without muddying the mix. 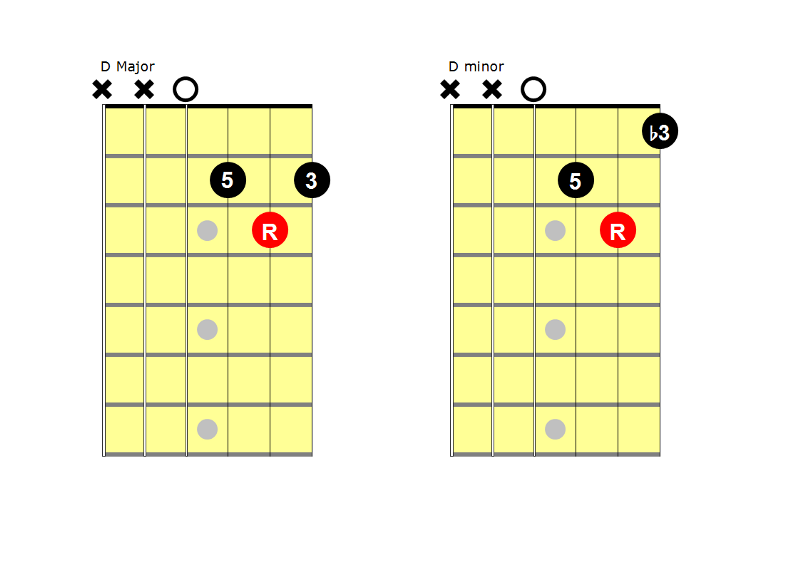 Following on from the previous section, let’s have a look at minor chords. Again, the shapes on a guitar can look quite complicated but become a lot easier to understand when you realise they’re exactly like the major chords except with a flat 3rd instead of a major 3rd. 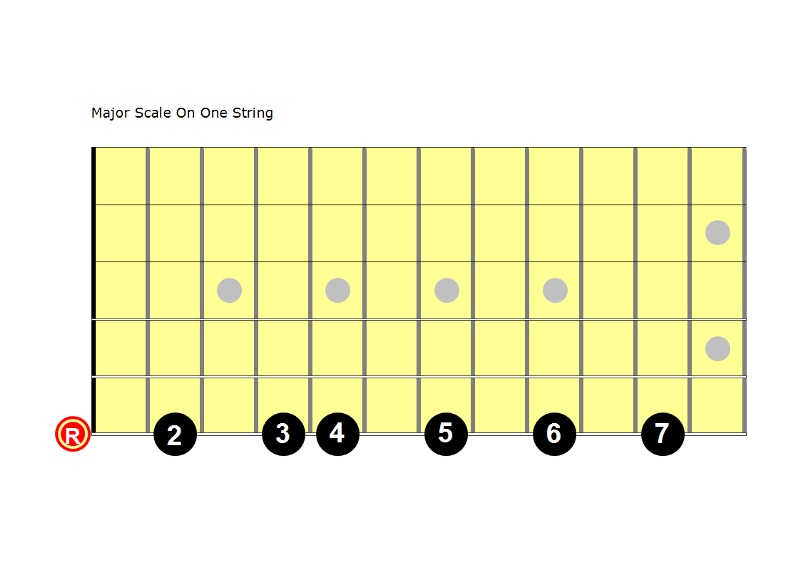 The simplest place to see this is with your open D chord shape. Starting on the open D string you have a root note (D), a 5th on fret number 2 on the G string (A), another root note 3rd fret on the B string (D), and a 3rd on the 2nd fret on the high E string (F#). If you just move that 3rd down one fret to an F, the entire chord becomes minor. Now we know how chords are made and how to easily switch between major and minor, we need a simple way to play them all. The CAGED system allows us to only learn 5 shapes and then build everything else from there. Learn your C, A, G, E and D major chords. Then learn your Am, Em and Dm chords. All these shapes can be turned into barre chords that will allow you to play anywhere on the neck. This is useful to keep your playing sounding smooth. You don’t want to play a chord up on the 7th fret and then have to leap all the way down to the 1st fret. Let’s take our open C major chord starting on the 3rd fret. This is obviously the C shape. There are another 4 ways to play this chord. We can move it up to the A shape which barres across the 3rd fret. The next shape would be the G shape which starts on the 8th fret on the low E string and barres across the 5th fret. Then we have the E shape which is a guitarist’s favourite. That one also has the root note on the 8th fret of the low E string and barres across that same fret. Finally, we’re left with the D shape which has the root note on the 10th fret of the D string. You can see how these shapes overlap each other quite a lot and let you use the entire neck of the guitar. A lot of the shapes are pretty impractical to play which is why knowing the 2 note theory from earlier is important so that you can select only the notes you need. At their simplest, chords are made up of only 2 notes. Major and minor chords sound very different but share all the same notes except 1. The CAGED system will open up the entire the neck for you. 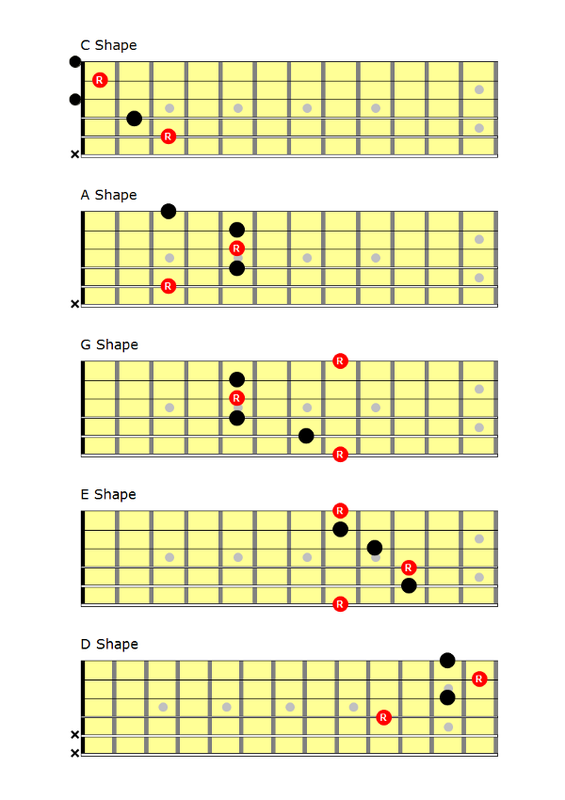 Knowing the chord principles will make guitar playing a lot simpler and will give you more creativity to choose the right notes. This can help every aspect of your playing and even carry over to new instruments you might pick up in the future.